The beauty of this scarf is in its simplicity, the perfect weight of warmth. 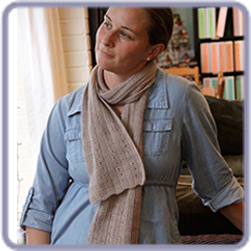 It's a one skein scarf but you might as well get two, because you are so going to want one for yourself! This Sea of Tranquility is exquisitely delicious. If you have any problems, please contact orders@bluemoonfiberarts.com. We will be checking each weekday morning to verify the links are being created. Check the box for a PDF version of the pattern to ensure you will get access to the download. Thank you!